It has been far too long since I’ve posted a new challenge for you guys! My apologies. I’m hoping that one of the upsides to the blog consolidation project is that it takes some of the barriers of blogging away… it was an awful lot to manage so many blogs, each with their own little foibles. This month’s challenge, which will start now and go through the end of June, is a subject very dear to me: muffins. I make muffins a lot. 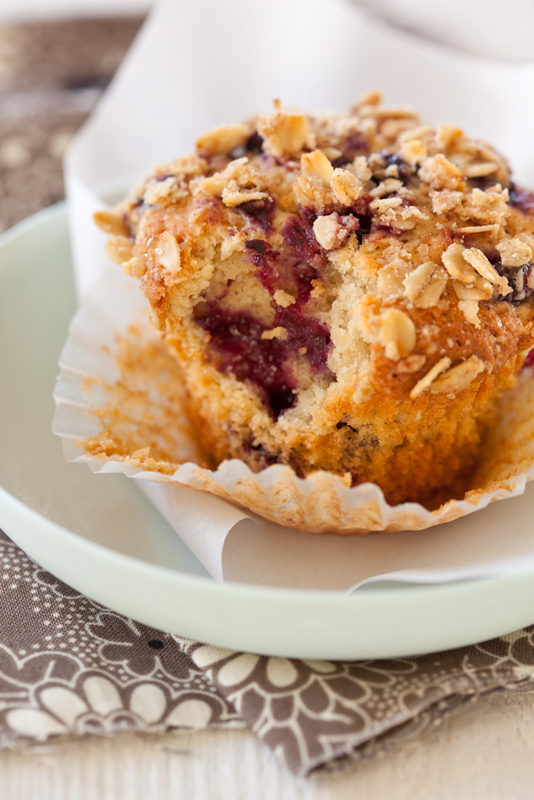 The particular recipe in the photo for blueberry streusel muffins comes from Lorna Yee’s beautiful cookbook, The Newlywed Kitchen. Whether or not you are a couple, this book is full of lovely, delicious recipes that really work and I’d highly recommend picking up a copy (or giving one as a gift if you do have a wedding shower coming up). These muffins are insanely soft and fluffy, packed with fruit and just the right amount of spice. For this challenge, you can use any sort of muffin you’d like though. I think the streusel topping gives a fantastic texture and adds visual interest, but your muffin can be simpler if you’d like. The key to this photo is the careful layering of linens, dish, parchment and wrapper, all that lead you up to that first bite. Getting a good bite can be a bit challenging because you want to make sure you hit the fruit and show a nice amount of crumb. It’s really helpful when you use the new diptych format when you post your results! The original photo goes on the left, and your take on the right. This challenge will run through the end of June. This entry was posted in Photography Challenges and Critiques, SLW Photo Remakes, Still Life With. Bookmark the permalink. Does it have to be in the same angle as the picture above or can it just be my take on photographing a muffin? The goal is to recreate the photo, so you should use the same camera angle. It’s fine to change things like the type of muffin, the props, etc., but to get the most out of the exercise, try to match the composition as much as possible. I learn something more difficult on unique blogs everyday . to read content from other writers and practice just a little something from them. Excellent photo that i not ever.really nice. food looks tasty thanks for sharing.